I chose Golden Retrievers as the dog breed for me because of their desire to please, loyalty, and trustworthiness. All attributes that I aspire to in my life and the way that I deal with my clients. If I had my way all Realtors would take the Golden Retriever pledge, “I promise to always think of my master (client) first and to search and find everything I can possibly do to make their life better”. I consider it my job to Make things happen and Get Results for my clients. This is the only way I do business, I'm just like man's best friend, only better! This is “Earnie“ one of the puppies from my Chloe's litter in 1998. 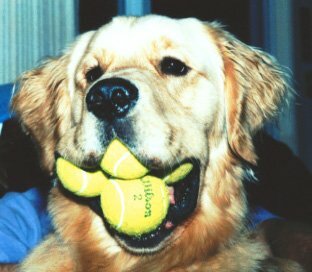 Earnie is infamous for his ability to hold four tennis balls in his mouth. Earnie's picture has been used in several advertising campaigns and is printed on a T-Shirt that is sold to benefit Golden Retriever Rescue. Earnie lives with some of my closest friends, Scotty and Michael Richardson of Vancouver who have worked tirelessly with Earnie in the Juvenile justice system Therapy dog program. His sweet personality and desire to snuggle with every person he meets has been a godsend to many a hostile and angry child. Somehow they just can't resist that unconditional love only a dog can give. Earnie has been instrumental in the rehabilitation of many of these kids. I love Vancouver and Clark County, it is a great place to live and work. I hope that as you browse through my website you will begin to love it as much as I do. Let me know if there is anything I can do to help.